I think back to the days when once upon a time Lucasarts was making Star Wars games. That franchise seems to have kind of died with Star Wars Kinect for the Xbox 360. Anyway, back when they were making Star Wars games, they were making some very good ones. Thus, here I list some of my favorite Star Wars games. Empire at War was far from Lucasarts’ first attempt at the RTS genre, with games like Force Commander and Galactic Battlegrounds having come before. Despite Galactic Battlegrounds essentially being Age of Empires II (a classic RTS) with a Star Wars skin on it, it proved to not be a ton of fun. Empire at War came along, and completely de-emphasized resource collection. You only had to worry about money. Battles took a cue from Battlefront in that you maneuver your units to capture spawn points, where you can call in reinforcements. Empire at War put the focus squarely on the fight, making the game much more fast-paced and fun than Galactic Battlegrounds turned out to be. 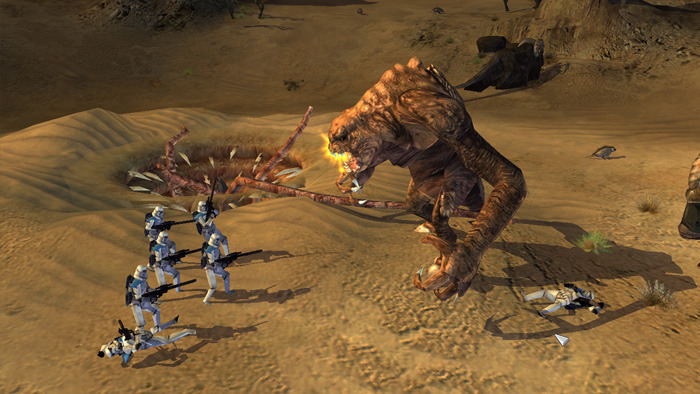 Star Wars: Battlefront (2003) was a popular shooter, owing to its robust multiplayer support. However, the singleplayer experience left a bit to be desired. In every way, Battlefront II improved on its predecessor. It still offered terrific multiplayer fun, but also added great offline modes like Hunt (scout troopers v. Ewoks is always interesting). Battlefront II also added two things that were critically missing from the first game to make it a real Star Wars experience: Flight combat and the ability to play as a Jedi. 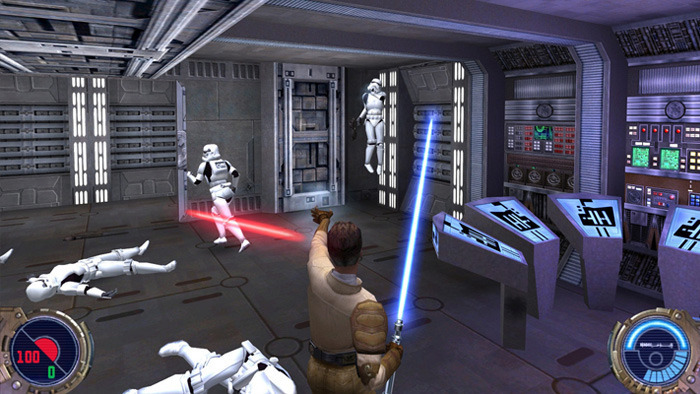 Speaking of playing as a Jedi, the first real Jedi experience came from 1997’s Star Wars: Dark Forces II: Jedi Knight. There, players assumed the role of Kyle Katarn, a Rebel agent-turned-New Republic agent who discovers that he is Force-sensitive. Using his newfound abilities, he has to fight Dark Jedi Jerec and keep him from conquering the galaxy. Jedi Outcast follows Kyle after some years have transpired since the previous game. Jedi Knight was a great game, but Jedi Outcast almost feels like a completely different game, and that is a good thing. Jedi Outcast starts off as an awesome shooter, but eventually Kyle regains his lightsaber and Force abilities. After that point, Jedi Outcast basically becomes every Star Wars fan’s dream-come-true, where you slice your way through stormtroopers, and even engage in lightsaber duels with Dark Jedi. The lightsaber duels honestly look like something that would have come out of one of the Star Wars prequels, and that makes for one hell of a fun game. This game can be summed up as: Get into an X-Wing. Shoot TIE Fighters. It’s awesome. 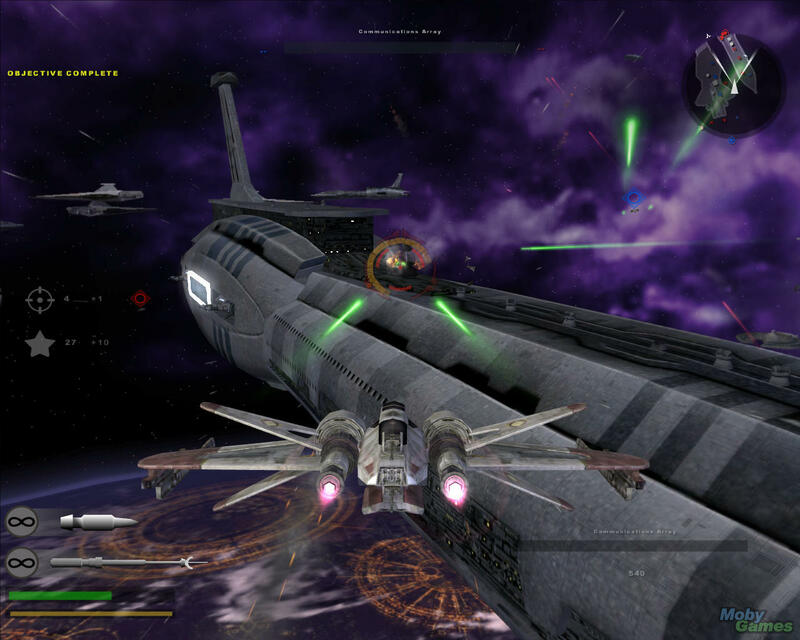 Rogue Leader follows up 1998’s Rogue Squadron (N64) as a launch title for the Gamecube. When it came out, it was easily the best-looking game around for Nintendo’s new system. Add smooth controls and lax arcade-like gameplay, and you have one awesome experience playing through many key moments in the classic trilogy like the Death Star Trench Run or the Battle of Endor while flying ships such as X-Wings or Y-Wings downing countless TIE Fighters. It’s only a shame the Rogue Squadron trilogy ended with Rebel Strike (2005). 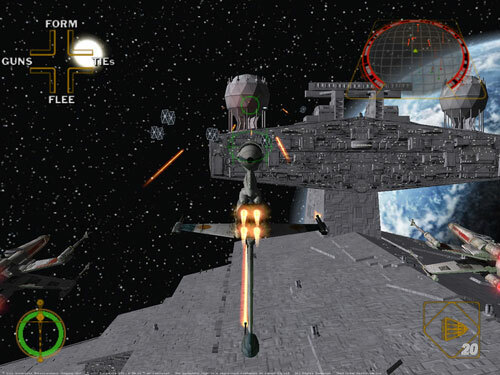 Rebel Strike featured what were possibly the best flight combat missions in the game, but was marred by the new (and awful) on-foot shooting segments. TIE Fighter, in almost every way, is the flipside to Rogue Leader. As the title suggests, you play as an Imperial pilot flying operations against the Rebels. 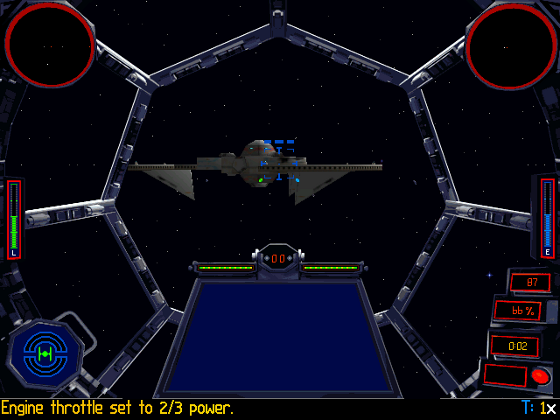 In addition, TIE Fighter (the second of Totally Games’ X-Wing trilogy, following X-Wing (1993) and coming before X-Wing Alliance (1999)) played more like a serious flight simulator, where you have to keep track of things like how you distribute power to your ship’s various systems while issuing orders to your wingmen. Overall, the learning curve was a little steeper (especially since you start by flying the really flimsy basic TIE in early missions) than that of the pick-up-and-play Rogue Leader, but it made for a very rewarding experience.